Thought I would share my little cottage style Christmas corner. It is right outside my bedroom door and really doesn't have much natural light, but the only spots I can call my own are my bedroom, bathroom, and this little corner. I already had most of the things in the corner . 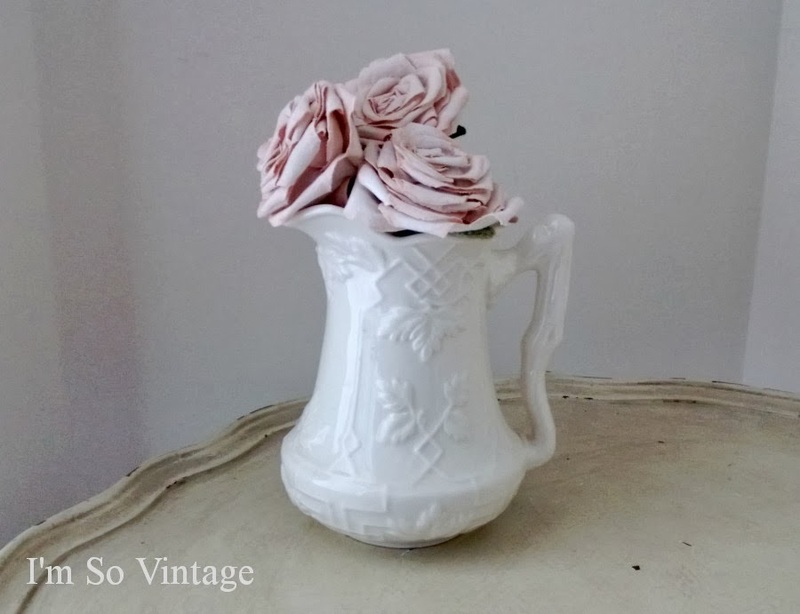 A little ironstone pitcher with some hand painted fabric flowers by my daughter. a photo of my mother dressed for a high school dance. I love this. 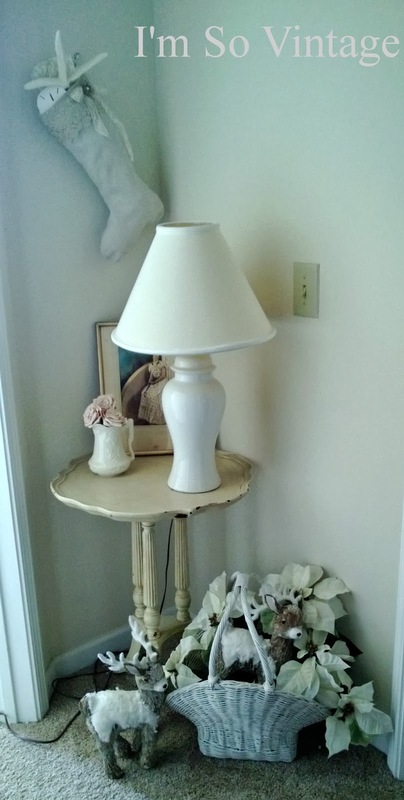 It normally hangs on the wall behind the table. 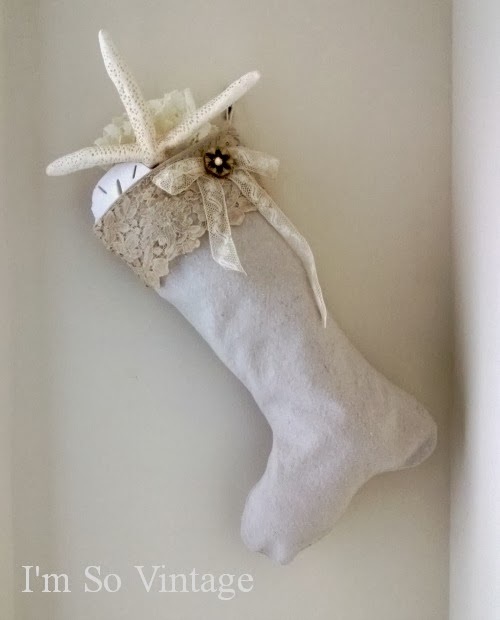 I set the photo on the table so I could hang this stocking I made last year. 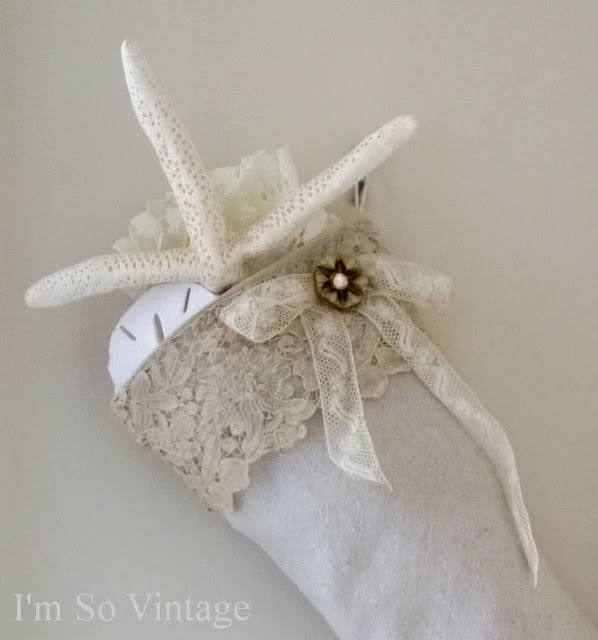 I filled it with seashells and vintage lace. 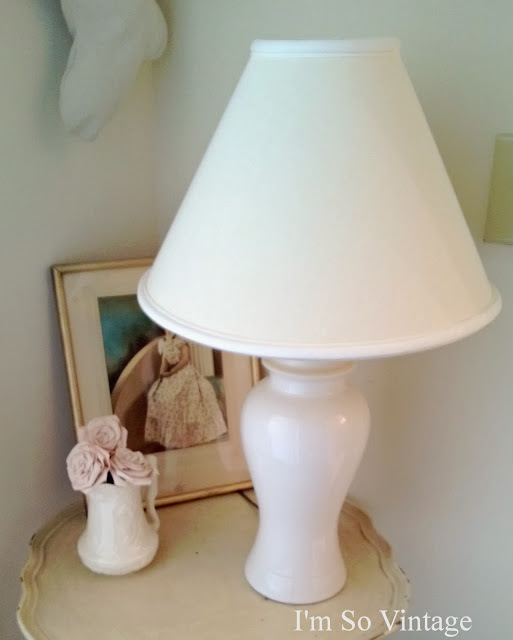 Added back in the five dollar ginger jar lamp I got at an auction last summer. 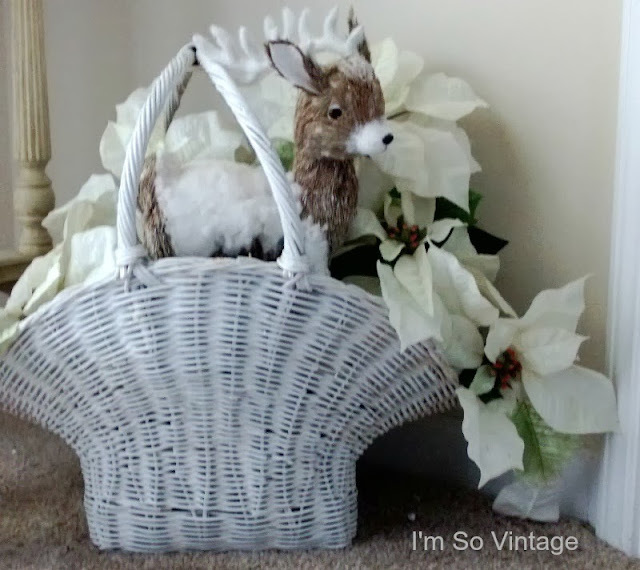 and filled a basket that normally sits there with some faux white poinsettias and two sweet little deer. Voila my little cottage style Christmas corner. 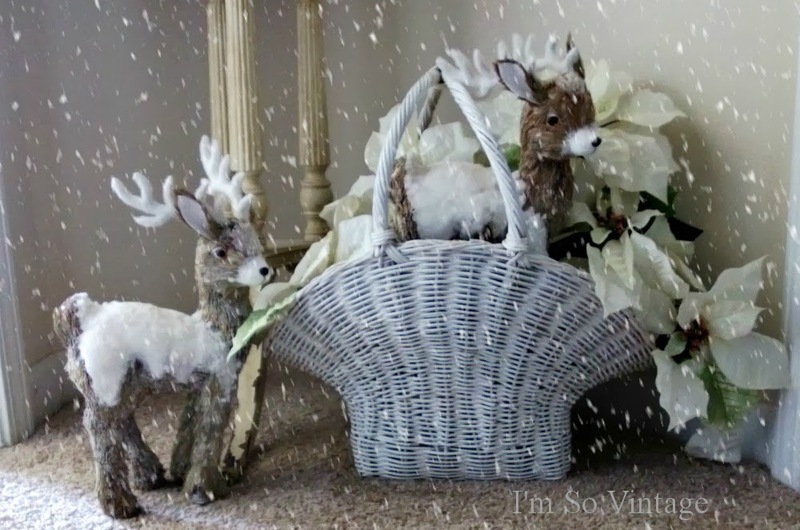 My little deer whispered in my ear that it isn't Christmas without snow, so I gave them some. Love the photo and the vignette! Hugs! The deer are lovely. Your mom looks so pretty. Her dress is charming. 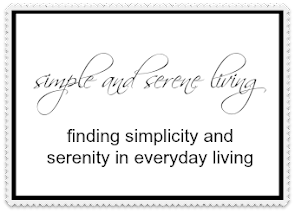 Sometimes I think pretty has gone out of style but it has a warmth and 'pleasure to the eye' quality more modern styles lack. Thank you, Susan. I love that photo of her. I adore the picture of your mom. That's something I'd see in an antique store and buy. Then I'd just tell people she's my long lost relative. haha. Laura, this is so you I could have day dreamed it when I think of you. You deer whisperer you! I love that sweet corner, Laura. That picture of your mom is gorgeous!! Thanks, Claudia. My mom has always been a beautiful woman. the photo of your mom is very special. The photos are all beautiful but the one of your mother is precious! That is such a pretty little corner! I love how you styled it. The stocking is sweet too. The little vignette you put in the corner is very pretty. Love the photo of your mother! I love the photo of you Mom, what a treasure. That stocking is so pretty! I love the seashells and starfish in it, like a gift from nature! 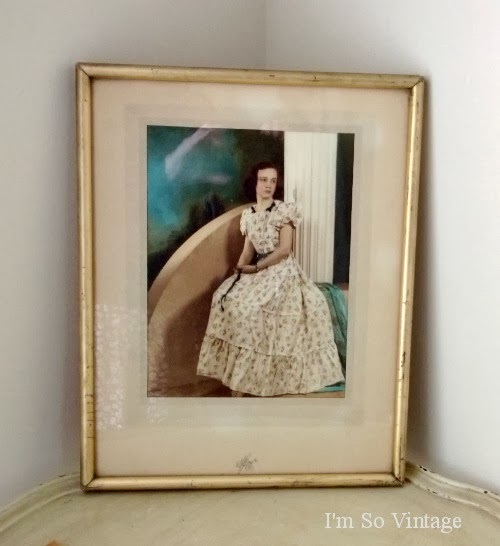 Love that picture of your mother...she and the dress are exquisite!